Don’t let perfection become the enemy of the good. Hi friend! I hope you had an absolutely marvelous weekend. It was 30C here in Saskatoon so after some yoga and meditation on Saturday & Sunday I spent the rest of the afternoon/evening at the beach! It was incredible and I had the best time swimming. It’s hard to believe it’s not even June yet and the river is swimmable. 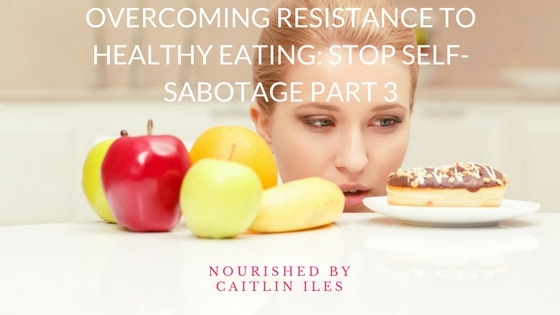 Today I’m going to share Part 3 of my Overcoming Resistance to Healthy Eating Guide. I’ve already covered some of the emotional & psychological, common sabotaging & resistant thoughts, and some physical aspects of resistance. Check out Part 1 & Part 2 to catch up! In Part 3 I’m going to share some of the External Aspects of Resistance, specifically you’ll learn how the people in your life can impact your ability to succeed when making healthy dietary changes. So without further ado, let’s dive in! They are used to seeing you in a certain way and don’t want you to change. Just like your unconscious mind likes to keep you the same, the unconscious minds of your friends like to keep their lives the same too. When you change it can be scary or threatening to their unconscious because they don’t know what might happen. Your changes highlight areas in their lives where they know they need to improve. People act as mirrors for one another so seeing you be successful with your dietary changes can make others feel guilty that they’re not doing the same thing, which can cause them to try to sabotage your efforts to alleviate their guilt. They love you just the way that you are and honestly don’t believe you need to do anything to improve. While this is a nice thought, ultimately it is your choice whether you undertake a new approach to healthy eating. With these folks it can be helpful to have an honest conversation about why you’re making changes and ask them straight out to support you. You’re being a little over-zealous about sharing the changes you’re making and they’re trying to bring you back to earth. Of the reasons listed here, this is the only one that is a reflection on your behaviour. It can be really exciting when you start making changes and seeing results and so there may be a tendency to want to share that with everyone you meet. This is natural, but can also be annoying. A good rule of thumb is to lead by example and don’t offer advice to people who haven’t asked for it. Ultimately none of their reactions (except #4) are a reflection of what you are doing, but of what is going through their own minds and lives. Try to be compassionate towards anyone who is not supporting you or trying to sabotage you, but within that realize when you need to be firm. If having an honest conversation about why you’re making changes doesn’t affect the way that they treat you it might be time to think about what kind of role they are playing in your life and if you still want them to be a part of it. If you’re feeling a little isolated as you work on making healthy changes, check out some of my tips on Building a Healthy Community. Ah the office. Home to cruellers, pizza parties, sandwich platters full of deli meat, and office birthday cakes. None of these foods are necessarily a pillar of good health and since it always seems to be someone’s birthday, or there’s a meeting, or someone is retiring these foods are an almost daily occurrence. Unfortunately for you, willpower is a finite resource. You can build willpower like you can build muscle, but there is a limit to how much you can handle on a daily basis, which makes avoiding that cake day after day very difficult. Remind yourself that this cake isn’t special and that you’re an adult who can buy cake any time you want it. Often the feeling that it’s a special occasion or that you can only have this treat now makes you more likely to indulge. Remembering that there’s nothing special about an office sheet cake can help you refrain from partaking if that is your ultimate goal. Bring your own healthy versions of common office treats so that you can still participate in office events and be part of the community without sacrificing your health goals. If you’ve thought about it and you want to have a piece of cake because you want to celebrate, then do it. So long as you’re not just eating it because it’s there or because everyone else is doing it then there’s absolutely nothing wrong with indulging mindfully! Well friend that’s Part 3 of the Stop Self-Sabotage series! Next week you’ll start looking at some general rules to follow when deciding which foods you want to avoid and from there you’ll get lots of detail about all the wonderfully nourishing and delicious foods that can make up your healthy diet! If this topic is something you’re struggling with make sure you download my FREE Stop Self-Sabotage Workbook by clicking here. Thanks for stopping by and have a sunshiney day!